Post your ideas for a final poster here! Since no other final poster seems to be on the horizon, let´s collect our best fan art in this thread. We can add a poll then and find out which poster you would have preferred. This is the place for your ideas. Post, please! I'm thinking of something based on the image of the stag statue. I see the stag -- and a helicopter -- silhouetted against a full moon or a setting sun. The statue is toppling over, at a 50-degree angle to the ground. It looks a bit like the helicopter is blowing the statue over. As it topples, it casts a broad shadow over the ground, in which a little tableau appears in film-noirish chiaroscuro: M and Kincade huddle in the snow several paces behind Bond, who aims his hunting rifle at a wild-haired man (Silva?) who is descending from the helicopter by a rope ladder. The whole thing is done is a palette of black, white, red, and dark blue. Obviously this is a difficult question to answer as we have not seen the final product. But if we say that the poster has to be evocative of the product, then from a purely visual point of view, it should encompass the visual inspiration of Deakins - in my opinion. I don't mind whether it is photograhic or drawn - while I admire the art of yesteryear, I am not hankering after more of the same. A superb photograph can translate all sorts of messages. But plastering an awkward shot of Craig onto a version 3 quad where his head touches the top of a poster edge fails in even the most basic of framing necessities. If we say the poster has to be photographic, there will be a shot which communicates speed and urgency. And some further photo manipulation to augment this, (I am reluctant to use the word Photoshop because of all the Fine Art majors on this board decrying the use of such...) would do the job. This would excite. This may be a question that is easier to answer After we have seen the film. 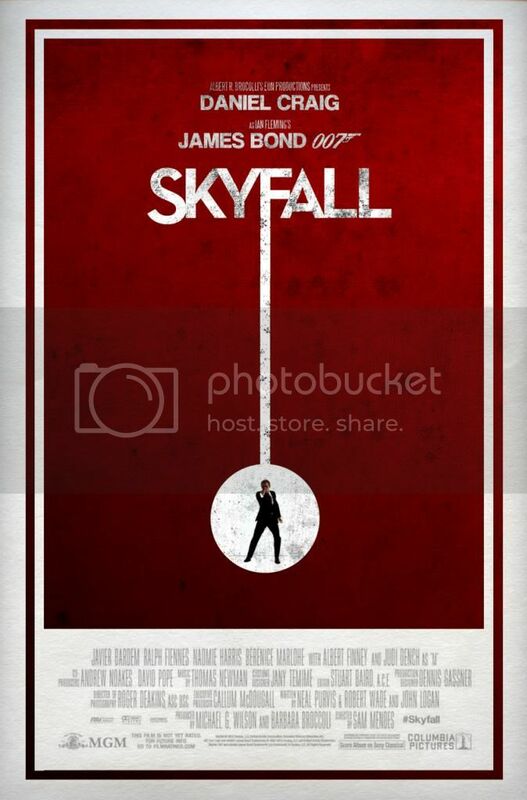 This would be the point at which the Skyfall poster Fan art thread should explode. I hope it does. And I hope (in vain) that Sony addresses this to the design house in question. I would have liked a continuation of the CR/QOS theme, with Bond and Eve walking with London in the background. If I had to come up with an idea for a similarly simplistic approach I would choose Craig's face behind the windshield of the Aston, with a single bullet hole over his shoulder, the cracks resembling the gun barrel. The has been a publicity shot of Moore in black polo neck and darkened hair (that one a wink at Napoleon Solo of UNCLE fame), who had posed behind a glass wall with several bullet holes for LALD. EDIT: Or make that two bullet holes with the cracks of the second adding a 7 to the 00. Edited by Dustin, 14 October 2012 - 11:13 AM. I was very fond of this, though of course it's hardly fitting for the final poster. Yep - that one would have been a brilliant teaser (although I do like the official one). Yep, my favourite as well. And this one is an instant classic! 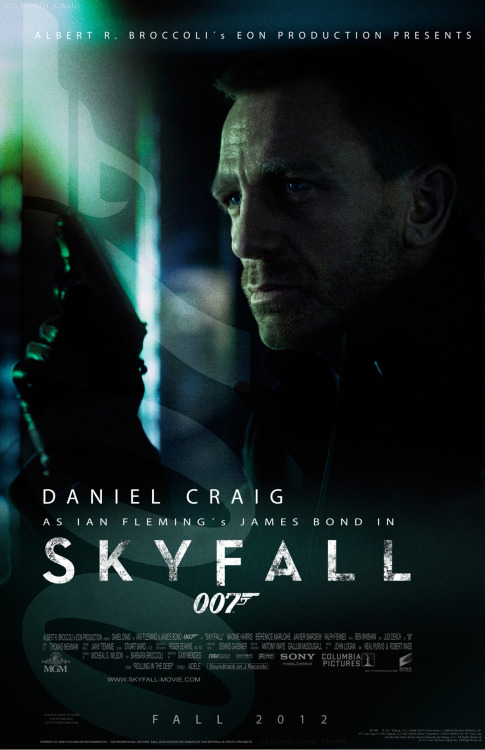 I'm not exactly sure what it should have looked like, but I would have liked to have seen a poster featuring Daniel Craig and Berenice Marlohe revolving around the "what do you know about fear?" line from the trailer. Something dark and sinister-looking while retaining some of the Bond hallmarks (since it is the 50th anniversary). I'm not even against the gunbarrel being featured in the posters, but I just wish it had been done in a more interesting way than how they used it in the teaser and the final posters. Wasn't the TLD poster also given the gunbarrel as backdrop? Yes (to the TLD poster)! And that one was IMO one of the best of the series. Edited by SecretAgentFan, 14 October 2012 - 04:14 PM. There was also a hint of gunbarrel in the US GE teaser poster.